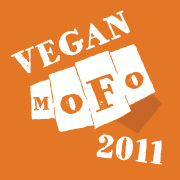 This, is the first of the themed posts for my MoFo. Mash-Up Mondays, where I will pair foods that you might not think should go together and pair them together in traditional foods. Tonight I will pair noodles with vanilla (and some other stuff) to make a very traditional Jewish dish known as a sweet noodle Kugel. This dish is served for break fast during Yom Kippur (which starts on Friday, October 7), so I thought I'd make up a vegan batch (even though I am not Jewish) because I like the idea of Teshuvah, or asking for forgiveness for the wrongs I have done. 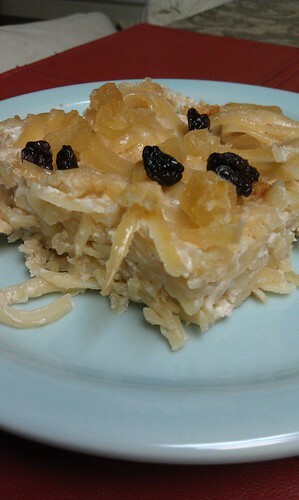 (READ MORE ABOUT YOM KIPPUR HERE) So with each sweet bite of this Sweet Noodle Kugel, I will be reminded to be kind and ask for forgiveness for the wrongs I have done to others. Religious or not, I believe it is good to forgive. Whatever your beliefs, why not try this traditional dish for breakfast or dessert. You will never look at linguini the same way again! I personally love it cold in the morning or warm for dessert with some extra EB melted over the top. Prepare the noodles according to package instructions, in a large pot. Prepare a 9x12 baking dish by spraying with nonstick spray, or rubbing with some margarine. Preheat your oven to 400 F.
When noodles are done, pour them into a strainer over the sink. Using the same pot, add all other ingredients (except fruit) and stir over low heat until melted and well combined. Add the strained noodles back into the pot and stir to coat. Sprinkle with dried fruit, if using. Bake for about 30 minutes, or until top is browned. Allow to cool for at least 10 minutes before slicing to serve. Love the sound of this, wonder how it will go with gf noodles! I have to make though particuarly as we have the word noodles in our blog title! I'm with radioactivevegan on this one. I, too, loved the way you presented the idea of honoring Teshuvah. Beautiful. I nearly jumped out of my chair when I saw this recipe pop up! Joni, my family has a noodle kugel recipe that dates back many years (it's actually my second cousin's Great Grandmother's, but my whole family claims it as their own). With a base of 4 eggs and a significant amount of cottage cheese, I found it a bit daunting to veganize. Several years ago my Dad made it with egg whites, splenda, and other "healthy" substitutions and no one has let him live it down since. 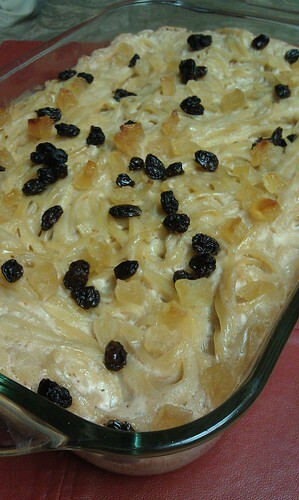 We enjoy kugel at practically every family gathering, brunch or dinner, so I'm hoping it will impress! Whoa dude, sweet noodles? My mind is blown. That's awesome. Love! I miss the sweet noodle Portuguese dishes of my youth (generally made with angel hair). I have to try this! Hey, I AM Jewish, and I think I'll try that this weekend! Thanks!